Just a mere week ago I came back from a trip to my favourite city: London! I don’t travel that much but have been there two times (1997 + 2005) prior to this trip which -again- only lasted a few days. Too short, as always but me and my dad managed to visit and revisit a bunch of tourists spots that you can’t find anywhere else on the planet. Our hotel was in Acton, a district in the borough of Ealing, a part of London I’ve never been to before but which turned out to be a rather nice town though nearly as busy as Central London. The Blue Star Hotel where we stayed was quite ok for the price but not a place to stay for longer than the night which was more than fine for us as we only did „bed and breakfast“. It’s also a chinese restaurant, modern design and great food as far as we could tell. Acton has, as I learned when we got there, the Acton High School and Centre for media arts (I would have loved to have a look inside there, just to see what that means) and one of the campuses of the Ealing, Hammersmith & West London College. 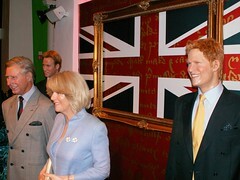 Both were on our daily way to and from the Acton Town Tube station. Acton is the only London district having a station for all four directions of the compass. There are two other interesting facts about Acton (courtesy of Wikipedia): It’s the birthplace of „The Who“ and two Monty Python sketches were shot their. However, the first afternoon we spend in Hyde Park and Kensington Gardens, a huge park in Central London that not only is a haven of recreation amidst the hectic city but is also home to many interesting monuments. Animals, especially squirrels and lots of water birds at the ‚Serpentine‘, live all over the place. As we learned you can go by bike (you can rent them on the spot), horse or foot. Hyde Park also seems to be part of many jogger’s daily routes. But then again we met those anywhere we went. Among the interesting spots are the Diana Memorial fountain (which was maintained so there was no water in it), a playground for seniors (yes, that’s the look on my face!) and several famous momuments like the Albert Memorial or the Peter Pan statue. Kensington Gardens of course lead up to Kensington Palace. Behind Albert Memorial we passed the Royal Albert Hall. We continued our walk through Kensington not knowing we would return here later and called it a day. The next day we made our round on the London Eye. I was there in 2005 but back then I didn’t see the pretty spectacular 3D movie they now show prior to your ride. The weather was rainy but that’s kind of what you expect, right? 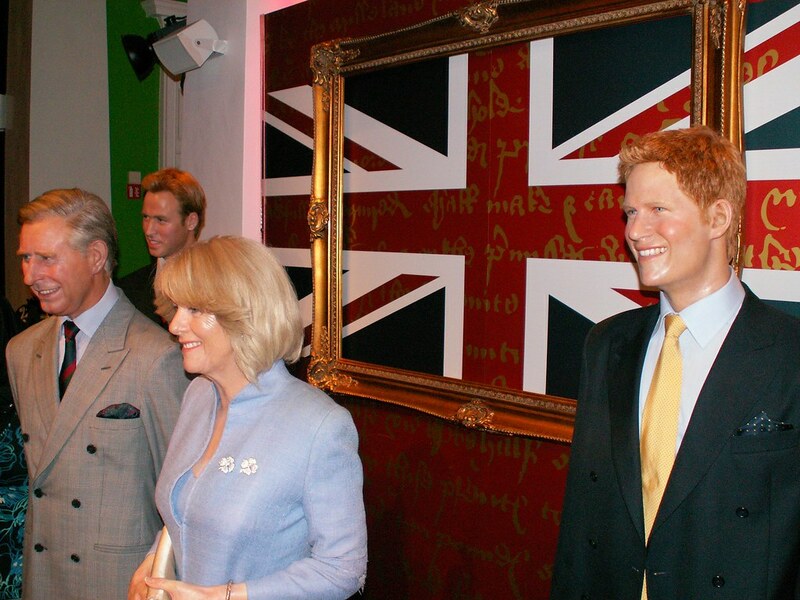 After that we visited Madame Tussauds which I saw in 1997 but they have extended the tour quite a bit (at least as far as I remember). I’m not going into any detail here but you can have a look at my photos on flickr. We then followed the traces of Sherlock Holmes visiting Baker Street 221b (The Sherlock Holmes Museum) which is only a few steps from Mme Tussaud’s. In front of the door a police officer seems to be on duty at all times. We were welcomed by Doctor Watson himself and then climbed through all the carefully restored rooms on 3 floors that depict the daily life of the world’s most famous private detective in great detail. Many items in the collection were taken from the numerous cases Sherlock Holmes became famous with, some of which I had already read about. 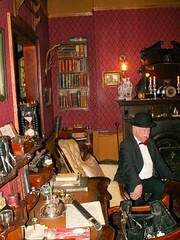 And while it should be clear that Holmes lived around the end of the 19th century (and even then was of course a fictional character invented by Sir Arthur Conan Doyle) even today people keep writing letters to him some of which are on display at the museum. After leaving a note in the guest book we had some Fish & Chips at a nearby restaurant. Newly refreshed we made a short trip to Trafalgar Square where the Malaysia Night was fully underway. We spent some time there then moved on to Big Ben and the Houses of Parliament passing the London Eye again. After just a few more pictures the day came to a close. 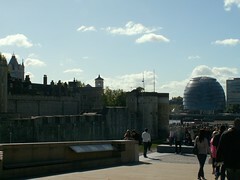 The next day we planned to do a London Sightseeing Tour and to visit the Tower of London. I also visited the Tower in 1997 but at this time we couldn’t see what is the main interest for any tourist coming here: the Crown Jewels. Well, we managed to see them this time around and also many other exhibitions so that, in the end, we spend about 6 hours at the Tower and could barely finish the sightseeing tour that day.The tours are actually regular busses driving certain routes all day so you don’t have to complete the tour in one go but rather can leave at certain stations and visit the places you’d otherwise only pass by. After you’re done you go back to the station and take the next bus on the route to continue your tour. This way you could actually spend a whole day on the tour. There is a tour with a real english guide but for foreigners they offer tours with recorded commentary in different languages. The first half of our last day (our plane departed in the late afternoon) we decided to visit the Science Museum which is only footsteps away from Hyde park and the Royal Albert hall. While many of the sights in town are indeed pretty costly some of the major cultural artifacts are free to visit including the Science Museum, the Natural History Museum or the National Gallery. The museum has quite interesting exhibitions on the Industrial Revolution, space exploration, a really nice interactive space on energy and many more subjects. We couldn’t see everything there but when we left after a few hours to catch our train to Heathrow people kept pouring in while rain started quite heavily. If you like any kind of science (and even if not) this museum will certainly have something in store for you. Highly recommended! I was surprised to find that Wireless Lan is available in almost any location at London. Furthermore I could use every BT Fon spot for free since I am a Fonero and offer a FON access point at my home. Through a cooperation with British Telecom there are about a million FON spots available in Great Britain, I found literally a dozen at the very street our hotel was at. If you’re not a fonero you can of course simply pay for it but there are also many other free access points. We didn’t go anywhere by car or taxi but we rather got around with the world’s oldest underground train, the London Tube. I ordered our tickets, called the Oyster card, prior to our flight so we had them ready after we arrived. The card is pre-paid and needs to be scanned at start and end of every journey with the Tube and if you get into a bus or tram. At the end of the day the cheapest fare for all your day’s travelling is deducted from the card. We spent about 20 £ p.p. during the 3 days traveling through Zones 1 to 3 and from and to Heathrow airport (Zone 6). You can top up your card at machines at most of the stations and many shops. 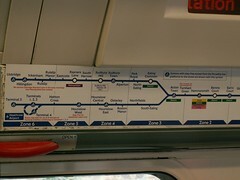 The Tube system may take some getting used to but it’s really simple once you get the scheme. However you should acknowledge a certain code of conduct (but don’t take this to seriously). The main form of nourishments in Great Britain obviously are sandwiches. You can get them almost anywhere, readily packed as single or sets of 2 or more and with hundreds of fillings. We got them during our two-hour-flight. We bought some at Morrison’s for light evening meals. Note: Any beverage with ’squash‘ in the name bears only mild resemblance in taste to the fruit printed on it. They’re also rediculously sweet (without extra sugar). Although we paid most of the tickets aso. prior to the trip or with credit card we also carried cash. In 1997 1 DM was about 3,3 £, in 2005 1 € came in at 1,5 £ and this year the exchange rate was at 1:1,1. So the Euro is pretty much coming close to the Pound sterling but as far as we could tell the prices have kept up with the rate. I hope my next journey to London will not again take 5 years to happen.